Is there a way to estimate the number of technologically advanced civilizations that might exist in our Galaxy? While working at the National Radio Astronomy Observatory in Green Bank, West Virginia, Dr. Frank Drake conceived a means to mathematically estimate the number of worlds that might harbor beings with technology sufficient to communicate across the vast gulfs of interstellar space. The Drake Equation, as it came to be known, was formulated in 1961 and is generally accepted by the scientific community. Frank Drake's own current solution to the Drake Equation estimates 10,000 communicative civilizations in the Milky Way. Dr. Drake, who serves on the SETI League's advisory board, has personally endorsed SETI's planned all-sky survey. The famous Drake Equation, which proports to estimate the number of communicative civilizations in the Galaxy, was actually the agenda for the world's first SETI meeting in 1961. 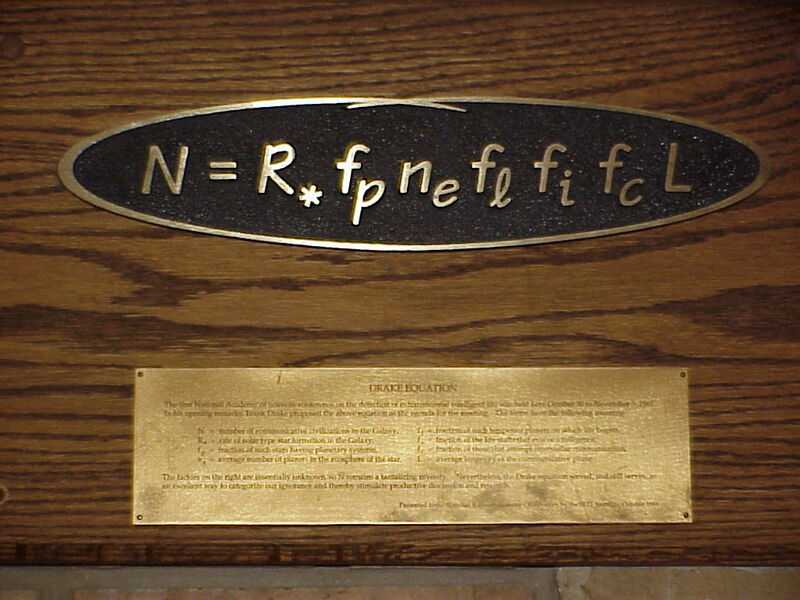 This plaque now graces the very wall of the room at NRAO Green Bank, WV which once held the blackboard on which the equation was first written.